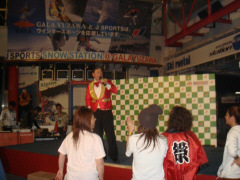 Lawrence Ly has just spent this last winter season working at the GALA Yuzawa snow resort in Yuzawa town, Niigata Prefecture. 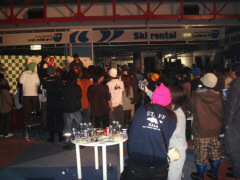 We spoke to him to find out more about his experience working at a Japanese ski resort. I am a university student from Melbourne in Australia currently on a working holiday visa. This is my 3rd time to Japan, but it is the first time working overseas and living by myself. I’ve been studying Japanese at university for two years and had previously studied it in high school as well. I’ve always had an interest for Japanese culture and a lot of my interests and hobbies are originally from Japan (anime, cars, music etc). I happened to stumble upon an agency that was advertising at the local universities for job positions in Japan. I saw this as a good chance and did some research and found a friend of a friend of mine who went through the same program last year. Was there a choice of resorts or did you just apply for a general position? 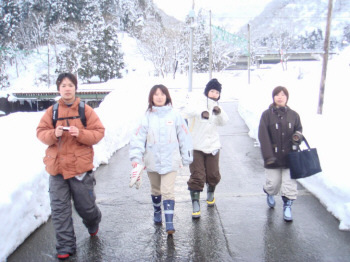 I originally applied through an agency which recruits people on behalf of ski resorts in Japan, but in the end decided to apply directly to the resort as the pay is higher and there are less restrictions regarding contracts etc. We got an email address from a friend and directly contacted the head of staff recruitment. We got a very positive response and sent over resumes in both Japanese and English. Interviews were then conducted over the phone in Japanese and the positions were confirmed as long as we could get our working holiday visas. In regards to job position, I was asked over the phone by the staff there if I was interested in any particular positions - I just replied that anything was fine. I expect that the most English used at the resort would be at the Information and Rental sections. Had you snowboarded much before you came? No. 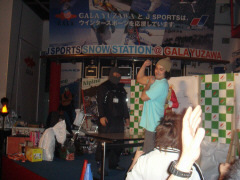 I started snowboarding at Gala. It’s great and I plan to continue snowboarding when I go back to Australia. 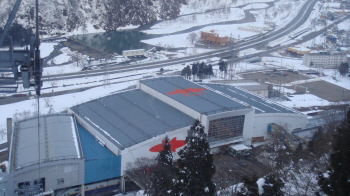 Had you heard of Gala Yuzawa before you applied? So what kind of work are you doing at the resort? I am working in the Rental department. I think it’s probably the best department on the whole because of the general working environment and the people that work there. It doesn’t seem to be as strict compared to Information in regards to company rules. For example, being late to work - which I have done a few times! The people are great. 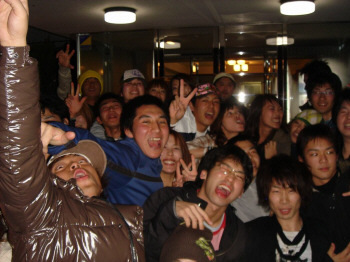 There are about 30 or so members in rental and everyone is friendly and from different parts of Japan. 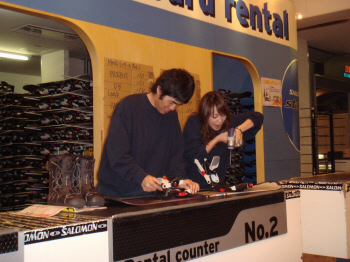 The rental station is actually sponsored or owned by Salomon (I’m not too sure on which one but internet rental applications are done online through the official Japanese Salomon website). So all our gear is from Salomon - boards, skis, poles, boots etc and they are all current year models. 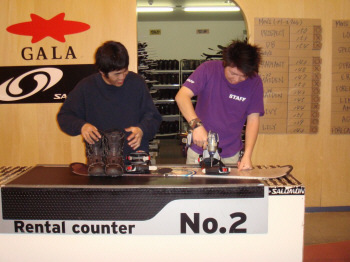 Rental equipment also get restocked every year with new models as well so customers definitely get good quality equipment when they rent at Gala. 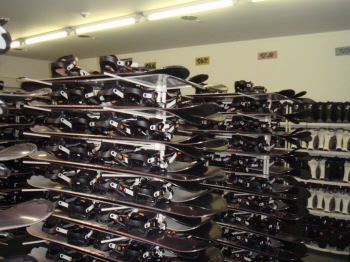 We handle the rental operations of skis and snowboards to customers and also do inventory control and maintenance of equipment like waxing boards etc. As I am a foreigner and am able to speak English, I have the responsibility of handling most of the foreign customers who come to rent. I help them fill out the application forms and assist them through the steps of the rental procedure. I also deal with Japanese customers where I can. So have there been many foreigners turning up to where you work? Oh yes, plenty. I would estimate during peak season that about 20% to 30% of rental customers were foreigners. This was a bit hard for me at times as I have to run counter to counter serving all of them! The work environment is quite relaxed. Being in rental we get privileges like being able to use any of the gear in stock. 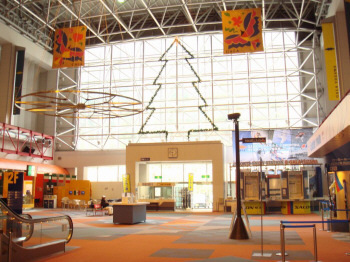 There are also regular breaks every hour or when there are no customers. Rental can get quite busy especially during the peak season on the weekends. Everyone starts work early, about 7:30 and finish up at about 11-12 for lunch. Lunch break is usually about 3-4 hours so most staff members use this time to go up for a snowboard session, finish up at 3-4pm, come back for 2 hours work and then they go home. Work load is usually 5-6 shifts a week. On days off work we are free to do what we like and most of us use this time to hit the snow. This is my friend Nancy (left). She is also from Australia and works at Information helping foreign customers. 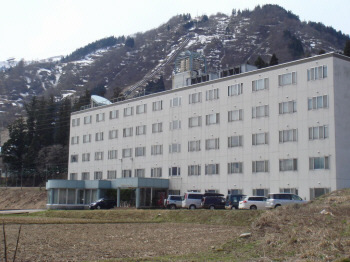 We are provided with a dormitory. Dorm rooms can accommodate 3 people. They have bunk beds and also lockers. Each room also has heating, tv, kitchen and bathroom. The dormitory has five floors levels and each level has a lounge for recreational activities (aka drinking and parties). Meals are all provided by the resort. On the ground level there is a dining hall where break fast and dinner is served. Lunch is a bento box which is eaten at the resort. 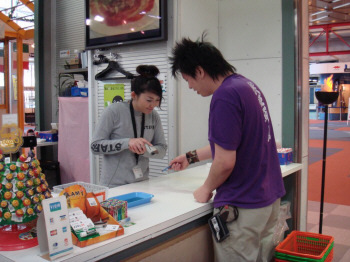 Meals are deducted as a cost from wages but is quite cheap, about 800 yen a day for all 3 meals. They also have washing machines and dryers for free use. The only thing they unfortunately don’t have is internet access. How were all the staff at the resort? Most of the staff in rental are young and fit in the 18-25 year old age bracket and most of their intentions for working at GALA are to snowboard or ski. Everyone is friendly and open minded and everyone gets along together well. We have drinking parties every month or so and also staff events to keep the ball rolling. 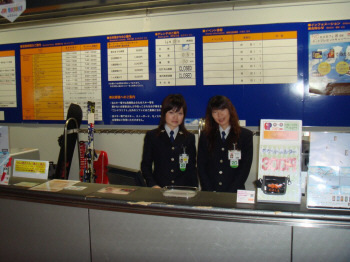 Many of the staff members come from areas near Tokyo like Saitama, Yokohama, Chofu, Kanagawa but we also have members from places as far as Fukuoka, Shizuoka, Okinawa etc. So the staff members are from various areas which makes it interesting. All the staff in rental are either a snowboarding junkie or want to become one! Most of them are into terrain park courses, so if you go to the terrain park at Gala, most of the boarders would be from rental. The most notable experience would be the incident we had in January when the Gondola had to stop due to extremely heavy winds. The actual Gala ski resort is located quite high up on the mountain - it is not like most other resorts where you can ski all the way down to town level. So the only way up and down is via the Gondala lifts. Unfortunately that day the gondola had to be stopped due to the winds and a number of people were stuck at the top of the gondola for a period of time. Not the best day! One of the great advantages to being a staff member at Gala is that we are not restricted to just skiing and snowboarding at Gala for free. There is this special lift pass we could obtain for free that would let us access Ishiuchi Maruyama and Yuzawa Kogen as well as Gala. 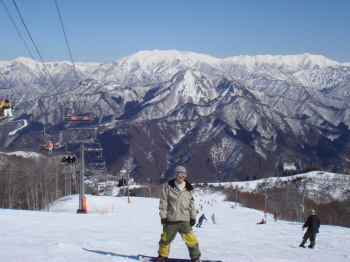 One of the courses at Gala actually connects to Ishiuchi Maruyama so sometimes we would warm up a bit on the course at Gala and then snowboard all the way to Ishiuchi Maruyama which has more variety and wider courses. The Gala staff event was also a lot of fun. This was held on 19th of March as a thank you from Gala to staff. It was held in Base Station "Cowabunga". Tables of food and most importantly alcohol were setup and also a stage was setup for events. The president and section manager gave speeches before an arm wrestling competition was held between all the departments (ie, representatives from Rental, Information, Patrol, Ski lifts, etc wrestle against each other to find out which department is the strongest). There was also a Bingo game where prizes were given out. 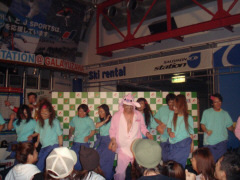 Last show was put on by the Rental crew where they did a dance routine from the popular DJ Ozma Age Age Everynight music clip. I will let the pictures speak for themselves. It was a very fun and entertaining night. One of the more pleasurable experiences at Gala. The whole experience at Gala is probably my most interesting job up to date. I definitely do not regret the experience and would love to do it again. The Japanese people I have met are extremely friendly and helpful - I’ve met a lot of new friends and my Japanese conversational level has improved a lot. I’ve also developed a new interest in snowboarding which I previously didn’t have and now I love it.